Google Docs editing for Android, iPhone and iPad isn't all that it could be, but it's a start. The long-awaited editing features are rolling out over the next few days for Android 2.2 and above, and for iOS 3 and above. Once enabled, you'll see an Edit button in the top right corner of any document. Tapping it takes you out of read-only mode so you can start writing. I haven't received the rollout yet, but judging from Google's blog post and demonstration video, editing appears to be primitive compared to proper office apps, with only the ability to write text in the document's current font, edit spread sheets and add bullet points. I do like how edits appear in real time, so you can collaborate from the road. 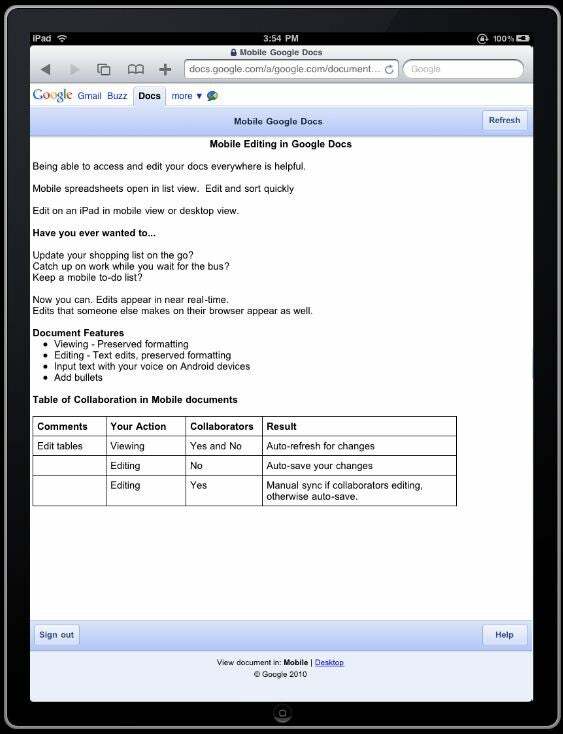 Now you can edit Google Docs work on the Apple iPad. Click on the image for a larger view. The list of missing features is still pretty long. You can't create new documents, change fonts or styles, add hyperlinks, format text, add images, or do any other advanced editing that Google Docs already allows on the desktop. Spreadsheet editing is also completely absent. For Android users, mobile Docs editing does add one neat feature -- the capability to input text by voice -- but considering everything you can't do with Google Docs on mobile phones, it's hard to recommend it over a proper document app if you plan to do a lot of work. For iPad, I still like Office2 HD, which syncs to Google Docs and has most of the editing and document creation features that Google Docs Mobile omits. I haven't had much of a reason to edit documents on the phone, so I'll default to PC World's App Guide, which gave high marks to QuickOffice Mobile Suite. That app, available for iPhone and Android, syncs to Google Docs and other services. Still, you can't argue with the free service Google is offering, and I have a feeling this isn't the last we'll hear of mobile document editing from Google.